The Cleveland Cavaliers did not finish the regular season strong. They backed their way into the second seed with a combination of poor defense, poor focus and downright dysfunctional play from March to April 12. Despite all those legitimate issues, Cleveland is the favorite to win a third-straight Eastern Conference Title. In the grand scheme, losing the top spot in the conference equates to one extra road game at most. If a team that features LeBron James and Kyrie Irving cannot overcome playing one extra road game, the problems run much deeper than just losing home court advantage. There’s a decent chance Boston doesn’t even get to the Conference Finals in the first place. (Or at least a better chance the Celtics are knocked out before the ECF than the Cavs). For the sake of argument, if it does come down to Cleveland vs. Boston, having those first two games in Beantown will be interesting. We know how this team tends to back itself in a corner before fighting its way out. It seems to just be how the Cavs roll. However, when it comes to the Cavs and LeBron in particular, rest and health are the two biggest positives Cleveland can have heading into the postseason. Would you rather have LeBron and Kyrie as fresh as possible? Or one extra home game? Tyronn Lue and the Cavs made it clear which side they’re on, as the two stars will have roughly one full week off heading into the Eastern Conference Quarterfinals matchup with the Indiana Pacers. For Cleveland, jumping out to a hot start (by playing with more energy) could save some valuable energy in the long run. If the Cavs breeze through the Pacers, that’s more time to rest and watch the playoffs unfold. Cleveland faced the minimum before the Eastern Conference Finals last year, which allowed LeBron to have relatively fresh legs for the final two rounds. He played some of the best basketball of his career in Games 5, 6, and 7 of the NBA Finals – while Golden State’s 73 regular season wins, along with an emotional seven game Western Conference Finals series may have caught up to the Warriors. This is a different Cavs team, but an especially different Warriors team. From Cleveland’s standpoint, all the Cavs can do is work on themselves for now to get back to playing at a high level. Despite going through a season in which Cleveland sufferred one injury after another, the Cavs actually enter the Playoffs as healthy as most fans would hope for. LeBron’s healthy, although he led the NBA in average minutes played. (A ridiculous fact for someone who’s 32 and has played more career minutes than Michael Jordan). Irving has dealt with nagging knee issues, but until he or the team give reason to believe it would be serious enough to derail the Cavs’ chances, it’s safe to say the Cavs have one of the best players in the league ready to roll for the playoff run. Perhaps more importantly, Irving just might be one of the most clutch players in modern basketball – and he’s only 25 years old. Having those two players on the court gives you a chance to win on any given night. There’s no question the role players will have to step it up. That has been one of the more frustrating aspects to watch in 2016-17. Cleveland’s bench is not good. There’s no other way to put it. Until they prove otherwise with actual play on the court, the Cavs’ second unit/rag tag rotation of pieces who don’t fit together *yet* is a weakness. Can they find a flow and rhythm before the conference semis or conference finals? There may not be enough time. This group did not get to jell because of injuries and last-minute adjustments to the roster. However, if role players like J.R. Smith. Richard Jefferson and Channing Frye can replicate some of their performances from last April/May/June, it would go a long way from turning the Cavs’ supporting cast from a weakness to at least an aspect that doesn’t hurt the team. It won’t be a surprise if Kyle Korver has a game or a few games in which he erupts, but it’s tough to project how he will fare. Korver’s foot injury has held him back since early March and he has not been the same player we saw in February. Tristan Thompson’s thumb injury is also something the Cavs will have to deal with. But as long as Thompson can fill his role, continue to create extra possessions on the offensive glass, continue to pick up switches/contain opposing big men, the Cavs should be in good shape in that regard. Kevin Love doesn’t have to put up All-Star numbers to make a huge impact, but by this point, we pretty much know what he can bring. He’ll stretch the floor, haul in a boatload of rebounds, knock down open threes and has the potential to get on a roll. If teams are somehow able to take away LeBron and/or Kyrie for a game or two, Love is certainly capable of making the opposition pay (along with Korver, Smith and Frye). The bottom line is that the Cavs are not in bad shape – at least not to the extent that some would like to believe. It’s funny how great the NBA is at finding ways to make even the most basic facts of life a dramatic, controversial storyline. Cleveland has the overwhelming edge in talent on every team in the East – but the sky is falling and we’re supposed to believe LeBron would let his team be embarrassed in the second round. The best thing that could happen for this team was to turn the calendar to the Playoffs. It’s a chance to hit the reset button. It may not erase some of the bad habits and issues that showed up throughout the season, but this is a new season altogether. Everyone is 0 and 0. The Celtics can’t take that one extra win with them when it comes to a seven-game series. Whether it’s Indiana, Toronto, Washington or Boston, if you really think someone is going to beat the Cavs four out of seven times in the Playoffs, my suggestion is go place your bets on it now because the payout would be awfully high if that does happen. If the Cavs are in as much trouble as some analysts seem to believe, it’d be foolish NOT to bet against them. But those same analysts or doubters are unlikely to put their money where their mouths are because as history has shown time, time, time, time, time and time again (six straight NBA Finals appearances), don’t bet against LeBron. 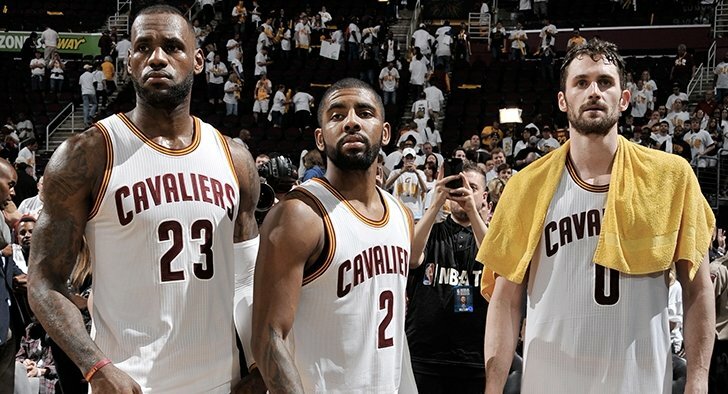 We can have a more serious argument about realistic threats to the Cavs in late-May, but just remember, last year’s Warriors were supposed to be a team of destiny. Things didn’t turn out too well for them when it was all said and done. I’ll leave you with the following quote from Tyronn Lue, which sums up the State of the Cavs (at least in the head coach’s mind) heading into the Playoffs. “The most gratifying thing for me is we completed the season healthy,” Lue said.